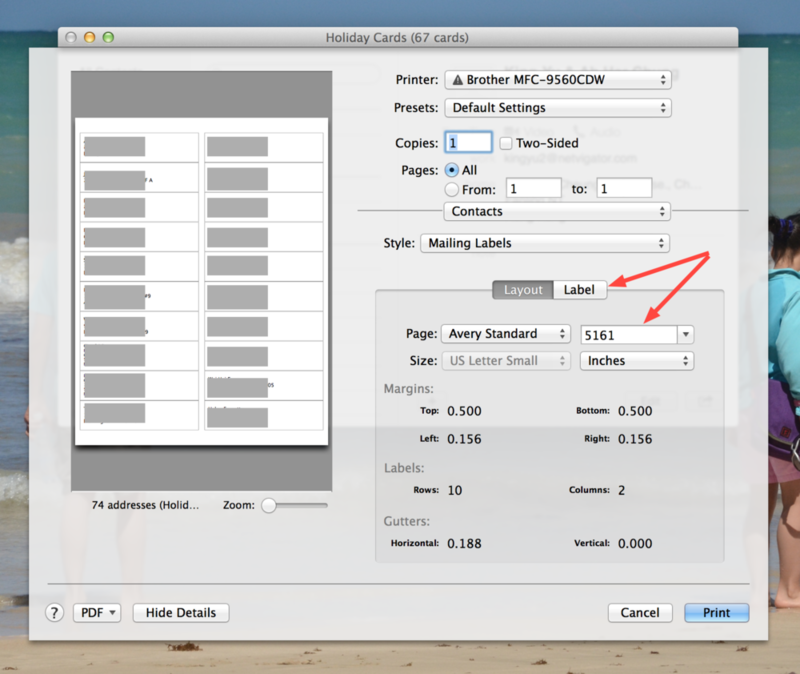 It is holiday cards time and every year I go through trying to remember to print address labels from my Mac OSX Contact app. The short answer? It is really simple. Create a CSV File for Export from Contacts? No. This is not the way. But the old school me always start thinking down this road. Then I realized there is no "export to CSV" feature in Contacts. You can however drag contacts into Numbers and the contacts will automatically converts to a table. Mail Merge directly from MS Word? No. Or rather, you could do this. If you create a new document from the "label wizzard" template in MS Word on the Mac, it will ask for permissions to access your address book. Allow it. (You could also enable the access via the Security & Privacy settings in System Preferences.) But frankly I cannot figure out how to use the mail merge feature in MS Word. Too complicated. No need to do export, conversions, merges. Just print labels. Throw out all the stuff that you don't need months before you even found the new house. Most of our time is actually spent on this part. It is hard, but do it. (Optional) Watch any of the hoarders TV shows for inspiration. Buy more boxes then you think you need. You can always freecycle them afterwards. U-Haul has an "unused box return deal", but I have never managed to figure out how it actually works. Buy large clear plastic boxes for packing heavier items or for items that you want to keep dry. You can end up using these for putting items in storage as well. We buy the large ones from Costco. Pack to unpack. If you are to take away one tip, this is it. Come up with a numbering system for each room and area in the new house. 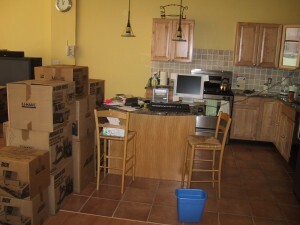 Pack items so that each complete box contains items that are destine for one room. Label that box with the number. Your movers will love you, and you just cut unpacking time in half. I put blue or white masking tape on the boxes, and write "(1) Kitchen", or "(6) Bedroom" etc on them. Label and/or map all your computer and audio/video cables so that you can quickly plug everything back together. Plan furniture placement before the move. Asking the movers to rearrange furniture over and over waste time and money. I (being a amateur architect of sort) create a site plan of the new home and lay it out on floor planning software before the move. Give the movers clear instruction, and let them do their work. Do not have unnecessary family members around to give contradicting directions. Make sure the showers are working great in the new house before the move. Bring a personal care kit with you. It is nothing more annoying then not being able to at least relax and clean up while unpacking. This is the only tool you need. Flip the key over and undo this screw. This is the only hard part -- use the tip of your screw driver to pry, twist a little and at the same time push the top of the case back away from the key. The top part should pop off with little force. The reason you need to push back a little is because of this "lip" at the back of the key that is holding the top down. Pop the actual electronics module out. You can see why Lexus build great cars. The attention to details os amazing. They put the battery type on the case itself in case you lost the battery. The battery type is CR1616. Undo the two screws on the electronics module, and flip open the cover. You can now replace the battery. Note that these two screws are of different length from the first one. I ordered my battery from Amazon. It is only a few dollars and gets shipped right to my door.